Send us an email. If anybody know the names,  please let us know. 1. Clyde Marsh was the teacher. (1) Carolyn Hunt recognize several fellow students: Clyde Marsh was the teacher,Rowena Seabolt,Charlotte Clevenger,Jerry Blankenship,Russell Moss,Doris Dailey,Orpha Rodebough,Carolyn Mourey,Genelda Ingle. (3) This is the first of several emails I will be sending with pictures from Dain, Walnut St. and Richwood Grade. I have listed as many people as I could. My mom, Flora Ingle, had listed some of the children's names on the back of the pictures. I'm Debra Ingle, graduated RHS in 1970. My two brothers, Gerald and David and my sister, Genelda all graduated from RHS also. 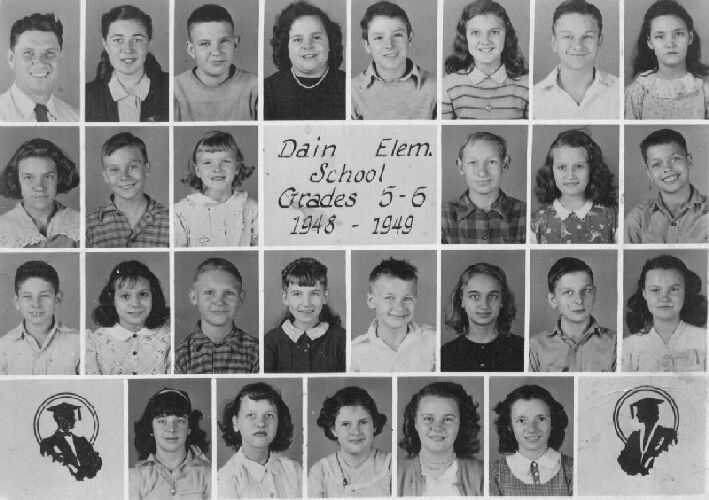 4th row: Betty ?, Carolyn ?, Genelda Ingle, Wynona ?, Thelma ?